Ever since my heart was warmed to the idea of welcoming a dog into my life, I've been dying for a furry companion. A little Yorkie with a pink bow in her hair to follow me in and out of East Village coffee shops and to the park would be the best, right? Unfortunately, my studio is too small for a little pup, so it seems I'll be waiting until I move to Brooklyn - in the far future - with a backyard and more square footage than my neighborhood currently allows in my price range. But, if I was ready to adopt now, it would be the perfect time. Because October is Adopt-A-Shelter-Dog Month! If you’re looking to add a new member to your family or become a first time pet parent, there’s no better time to search for a dog to adopt. 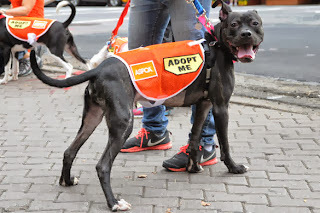 Check out these New York City shelters to find the right four-legged friend for you.